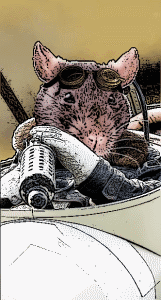 Wings and Tails is a high adventure, steampunk roleplaying game about the clashing worlds and dangerous politics of the frontier Mouse Kingdoms. This game is written as an expansion to Savage Worlds Explorer's Exdition, but can be adapted to any roleplaying system of your choice. It includes optional rules to integrate "Wings of War" WW1 air combat boardgames rules into your roleplaying adventure. In addition to an illustrated world history, six playable character archetypes, and 19 pages of printable game resources, Wings and Tails contains a complete 4 chapter adventure, fully scripted with branching story lines. Designed to be run in 4 evenings, the adventure is perfect for novice Game Masters, and has enough depth to thrill veteran adventurers as well.